Ensure you’re at your clinical best! 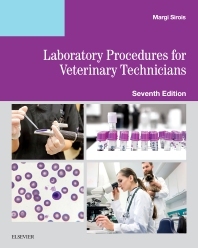 Laboratory Procedures for Veterinary Technicians, 7th Edition covers the broad spectrum of laboratory procedures that veterinary technicians need to perform effectively in the practice setting. Comprehensive content presents the fundamentals of microbiology, hematology, urinalysis, immunology, and cytology, along with the laboratory procedures used to perform the most widely used tests such as complete blood count, urinalysis, and immunologic assays. This thoroughly updated edition includes an expanded Quality Control and Record Keeping chapter along with the latest advances in veterinary clinical procedures to prepare you for real-life laboratory work. Comprehensive coverage gives you a solid foundation in the fundamentals of microbiology, hematology, urinalysis, immunology, and cytology, along with the laboratory procedures used to perform related tests. Provides the latest information needed to successfully perform a broad spectrum of laboratory tests, including complete blood count, urinalysis, and immunologic assays. Step-by-step procedure boxes offer quick access to the skills you must perform during your educational program, as well as procedures that are commonly performed by vet techs in private practice. A comprehensive glossary of terms at the end of the text offers accurate, concise definitions. Vet Tech Threads provide you with introductions, suggested readings, boxed technician notes, learning objectives, chapter outlines, key terms, and a glossary for easy navigation through chapters and more focused learning.